Behold the Turzum Enigma Spring Black. Yes black. If you knew nothing about current first flush processing of Darjeeling, you would be confused how a white tea got mixed up in your black tea sample. Even the furry whites of the dry leaves looked like someone had sprinkled bai mu dan straight into the mix. You might wonder if this discrepancy is the meaning behind the name. It wrongly brings to mind the controversial case of Rachel Dolezal who was forced to step down from the NAACP for falsely representing herself as an African American. Dolezal insisted she "identified as black" although she was born white. First flush black Darjeelings now either skip or undergo the briefest oxidation process to bring forth their delicate flavors. It seems to be internet tea gospel that this practice was driven by market demand from Germany and Japan for lighter teas. teasnob pegs this trend as occurring in the last 10-15 years while this vendor post attributes the initial trigger to Germans as early as 1960s and 70s . Probably both are right and the lightening of first flushes may have happened in multiple phases. 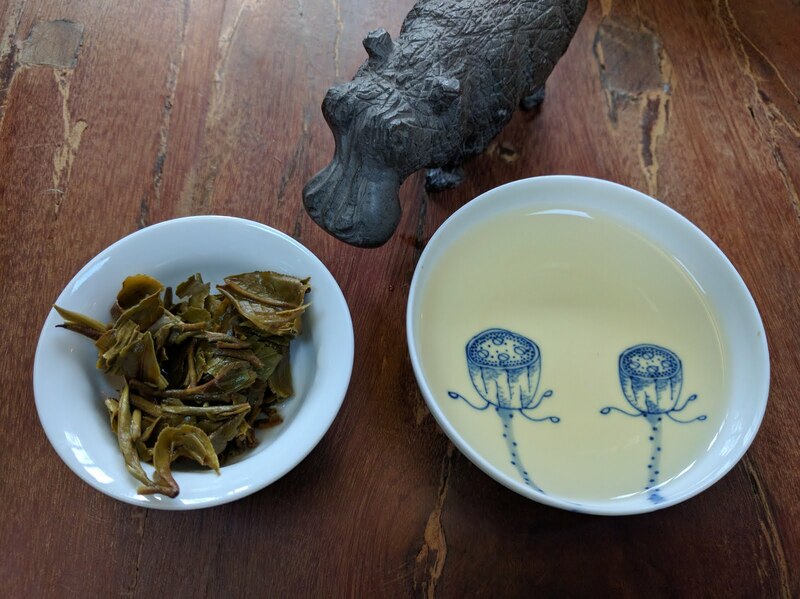 Many of these first flushes feel significantly under-processed compared to those I drank 15 years ago but since I haven't drunk first flush Darjeeling in 15 years, I don't know if the switch was more gradual. Because producing green and white tea is relatively new to Darjeeling compared to the Chinese who have been at it for centuries, some of the tea estates haven't quite gotten it right. A few of my samples taste awkward and could not hold a candle to quality lu cha. This organic Enigma is ripping my stomach with it's slow burn astringency which I did not detect in the cup. The Castleton Classic was also a bust unless you need a dry mouth. I don't subscribe to this new fangled regime of minimal processing. Some light fermentation brings out the complexity in Darjeeling and thus far the samples with slightly more fermentation has been superior to all the white and green "style" first flushes. The Goomtee Muscatel has been the standout but I am only on sample #7 out of 36. What to do with all these bags of under oxidized Darjeeling? My ever reliable husband states they are fine for him. I might use a few pinches here and there when I make my afternoon blends but I am hopeful more gems may be hiding in this first flush party pack. I realize that delicate lady teas like Darjeeling have a limited scope in my tea life because the role of hongcha in my day is to knock my noggin awake in the mornings. I had better go in search of something stronger, maybe a Nilgiri that is said to be a real man's tea. That looks about right. I have a ceramic pot I use for Darjeeling and it is hardly stained. The only Darjeeling I really like consistently though is Goomtee estate, and all the Darjeeling I have is samples I get when ordering other things. Once in awhile it is a good perk up after a nap.